Join A Geek Daddy and some of my friends from The Toy Insider for a fun Halloween themed Twitter Party sponsored by Disguise, the world's leading costume design & manufacturing company, on Friday, October 14, 2016 from 11 am - Noon EST. Answer the questions shouted out by @TheToyInsider including the hashtag #DisguiseLEGO in your replies for a chance to win brand new costumes from Disguise's new Halloween lineup of children's LEGO costumes. You must RSVP in advance of the event to be eligible for prizes! With fan-favorite characters Kai, Lloyd, Jay, and Nya to choose from, kids can instantly transform into a master of Spinjitzu by wearing one of Disguise’s awesome Ninjago costumes! True to LEGO aesthetic, Deluxe costume tunics are created to mimic the LEGO minifigure styling; while the Prestige costumes also include minifigure pants that feature the character’s block feet. Both costumes feature a long-sleeved tunic with detailed Ninjago print on the front and back with a metallic print emblem along with a mask and pair of LEGO hands. Available Sizes: Child 4-6, 7-8, and 10-12. Kids can step into the magical kingdom of Knighton and become a Nexo Knights character in one of the heroic costumes as Clay, Aaron, or Lance. True to LEGO design, the Deluxe costume tunics are created to resemble the LEGO minifigure, while the Prestige costumes also include minifigure pants that resemble blocked feet. Both costumes includes a long-sleeved tunic with padded shoulder armor detail and Nexo Knights print on the front and back along with a mask and pair of LEGO hands. Available Sizes: Child 4-6, 7-8, and 10-12. Five lucky winners* will be able to choose either a LEGO Nexo Knights or a LEGO Ninjago Deluxe costume plus one lucky grand prize winner will win one of both costumes! 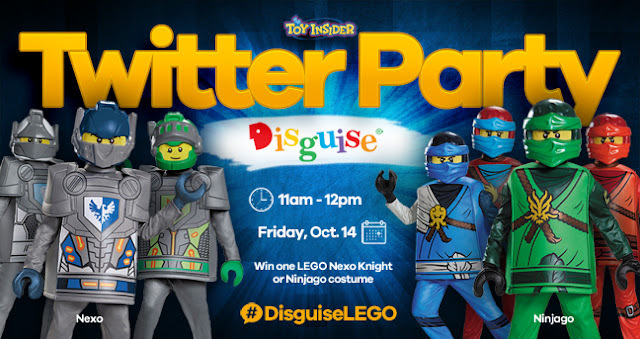 To be eligible to win you must RSVP in advance of the party, follow @TheToyInsider, @DisguiseInc & @Geekdad248 plus converse throughout the event using #DisguiseLEGO in your tweets to communicate with the party hosts and other participants. This contest is open to US residents only. Vulgar language or rude behavior towards the sponsoring brand, event hosts, or any other participant involved with the Twitter Party will result in an individual being disqualified from prize consideration. Winners will be randomly selected from all Twitter Party participants who have complied with the rules above. A Geek Daddy has been financially compensated for participating in the #DisguiseLEGO Twitter Party. *Winners will be able to choose which size they’d like their prize to come in.